Another film with a video cover that looked just a little too much for 12 year old me when released, meaning I missed out on this minor gem until I was too old to appreciate it. For some reason I always mixed up Fright Night with Tales from the Crypt, meaning I expected one of those compendium films with three or four shorter stories instead of the full fledged Vampire film that I ended up with. 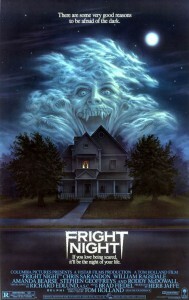 In extremely familiar circumstances to many other films (The Burbs, House) Fright Night finds a young school student named Charlie – a horror film fan – dealing with the realization that perhaps the new neighbours might just be vampires, not especially good timing seeing as it happens on the same night that his long time girl Amy decides to “give herself up” to him. Unlike EVERY OTHER TEENAGE BOY IN HISTORY Charlie takes asks for a rain check from Amy even after she’s assumed the position – so to speak – just because he saw people carrying a coffin across the yard next door. Speaking for myself at that age smacking me across the back of the head with a shovel wouldn’t have distracted me one iota, I guess Charlie was made of different stuff. Over the next few days Charlie sees and hears things that elevate his threat level, meanwhile corpses start piling up. He decides that the new neighbour is indeed a vampire, only no-one believes him, not his Mum, not the cops, not even dear old Amy. So he does exactly what any lad should do and asks his whiny mate for help and advice. The whiny mate has a nasal high pitched and frankly offputting voice, he also laughs like an idiot and seems to snort at the end of most sentences. For some reason he remains just as annoying and obnoxious and they justify keeping him in for the remainder of the film. There always seems to be the dorky sidekick in these sorts of films – I just can’t remember one so clearly abhorrent. The one worthwhile thing this dipshit tells Charlie is that vampires can’t enter your home unless you invite them into it – Let the Right One In also sees the vampire having to deal with the same issue. All should be sweet… but you should always think about the innocence of your Mum, that very night she not only lets the guy in, she invites him to dinner! The neighbour is a suave, smooth talking, good looking man named Jerry Dandridge, at least to Mum and everyone else. But as soon as he and Charlie are alone or if no-one is looking he lets Charlie see the real him, and openly tells him that he is coming to gettim. So the cops, GF, loser mate and even Mum have failed him so Charlie turns to the one guy who surely must come through, a late night host of crappy horror movies called Price Vincent (get it?). ultimately Amy comes back onside – which is important as she must play a key role in the vampire’s masterplan, and Charlie, the old hack and Amy must battle the evil undead for control of both Amy and their lives. Aside from one scene this is all reasonably tasteful and even low key in stretches, far from some of the more over the top antics of say From Dusk Til Dawn or other 80s horror films. There was one particular scene though where they obviously went balls-out to make an impact. With minimal gore or massive makeup effects there isn’t much to report on that front, but there are a couple of memorable decompositions and a cool – if awkward – transformation sequence. 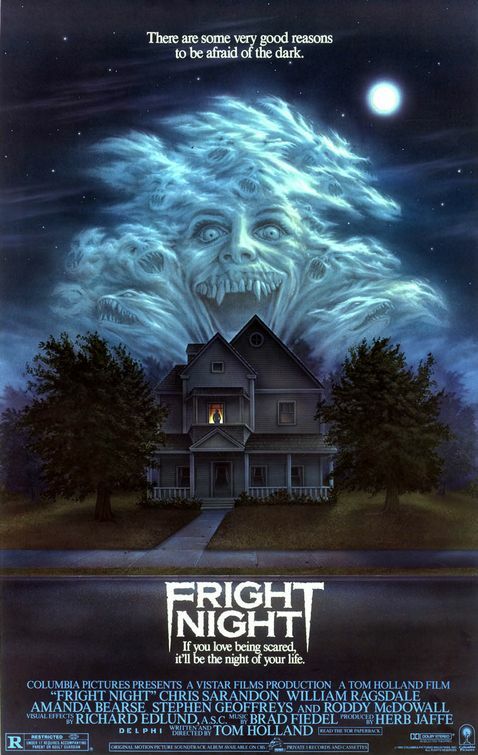 I found Fright Night refreshingly low key and old school, where perhaps many other films of the era might have let things degenerate into a schlockfest they spaced out the early kills and confrontations and allowed things to build up to a short but impactful finale. Final Rating – 7 / 10. Not the best horror movie of the era, but alongside The Gate a solid 80s effort and an ideal non-threatening intro to the genre for a newbie or a movie marathon.